Organize contributors by splitting them into groups for effortless management. A user group is a set of users with equal rights and permissions. Groups of users with a certain permission set can be added to and removed from any project with a single click. manage permissions, e.g., limit access to different projects. To create a new user group, select the User groups tab from the list on the left, while in the Team settings menu, then click the Create new group button. Give your group a name and click Create group: the new group will be added and you will be taken directly to group management. Let’s see what settings there are. This tab allows you to add users to the target group. You can add existing users from your team, or invite new contributors straight away by sending them an email. Use the Remove from group button on the right if you do not a user to be a member of the target group anymore. Once you assign a user group to a project, all group members get the same permissions for that project. If a user has already been assigned to the project, they will inherit both sets of permissions - from the group, as well as individual. 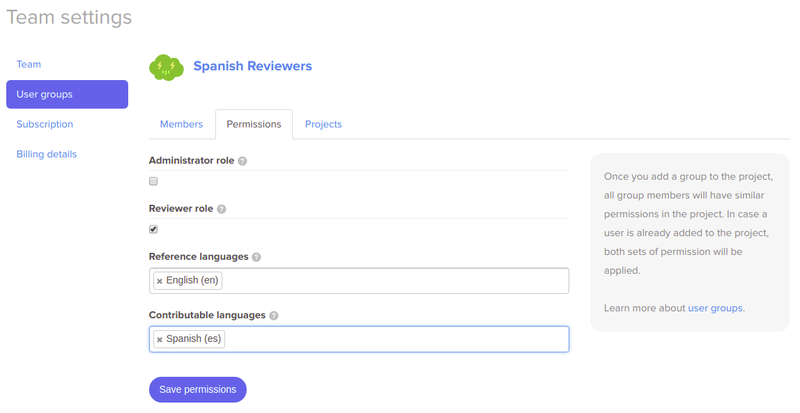 For instance, you can create separate groups of admins with full or limited access, a group of reviewers, or a group of translators for a particular language. Learn more about contributors and access levels here. 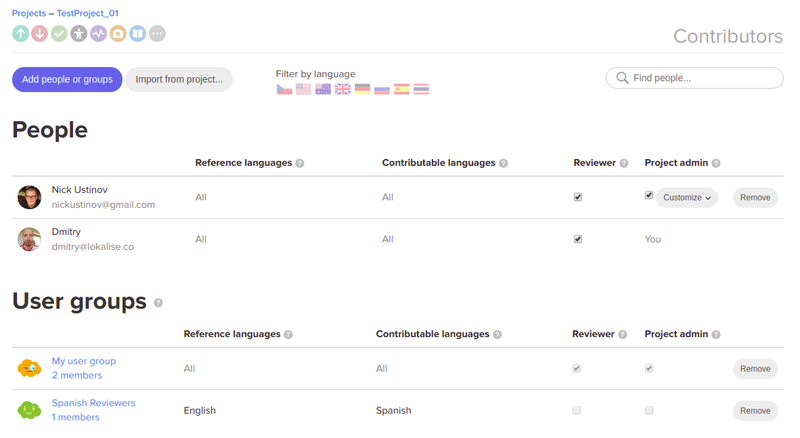 Note that users with admin rights have full read/write access to all project languages; however, such users can still be granted limited access to project features. Do not forget to hit the Save permissions button to apply the changes. A user group can be added to a literally unlimited number of projects. All projects, which are currently linked with the group, are listed here. Additionally, you can also remove a user group from a particular project using the corresponding button on the right. The Team section has the full list of your existing users, with their roles and assigned groups. The groups are displayed as tags for your convenience. For each user, you also see to how many projects they belong. This view is useful for centralized management across projects. In the Team role column, you can change the users’ function within your team. Regular members have no administrative rights; team administrators have advanced management permissions, such as access to invoices and allowance to create new projects, as well as promotion of other team members to admins. Team owners have the highest level of permissions, which include those of admins and some additional ones, such as promotion of other users to owners. Click the ? icon next to the Team role button to see the full description. Contributors page in each project includes information about people and user groups involved in the project. Such per-project view is convenient when you need to concentrate on a particular project and figure out how to allocate your contributors in the best possible way.